Acqueon Engagement Cloud (AEC) is an outbound voice dialer platform that provides real-time lead filtering, segmentation, prioritization, and scheduling. This integration between AEC and Amazon Connect helps significantly improve right party connect (RPC) and agent efficiency to align with your business goals. AEC provides an all-in-one proactive engagement solution that supports multi-channel communication toolsets, including email, SMS, and in-application notifications. You can orchestrate engagements based on user preference, business goals, and machine learning. AEC includes built-in compliance modules for the Telephone Consumer Protection Act (TCPA) and Ofcom regulations, and supports Do Not Call (DNC) scrubbing. For more information about AEC features, see the Acqueon website. A highly available architecture that spans multiple Availability Zones. An Amazon Elastic Compute Cloud (Amazon EC2) instance with Windows Server 2012 R2, to host AEC core and web applications. An Amazon Relational Database Service (Amazon RDS) for SQL Server DB instance to store, segment, enrich, and process the lead list; to store contact results for reporting and business intelligence; and to provide advanced analytics to optimize RPC. An Amazon Simple Storage Service (Amazon S3) bucket for storing contact files. 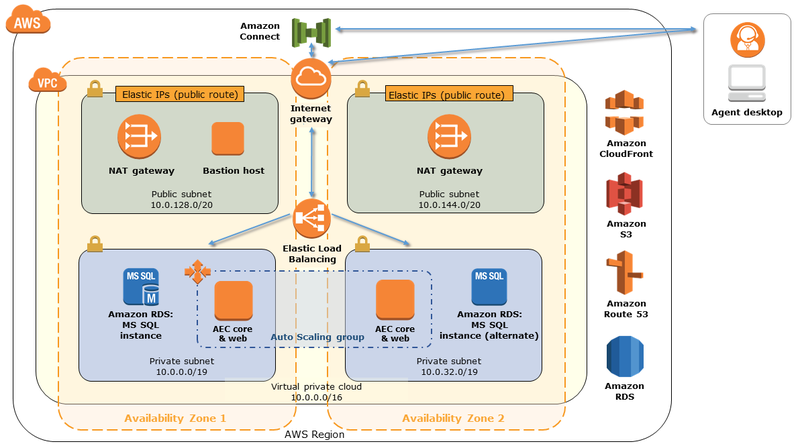 Record set entries registered in Amazon Route 53 for Amazon CloudFront distribution. This Quick Start was developed by Acqueon in collaboration with AWS. Acqueon is an APN Partner. Complete the parameter fields. Deployment takes about an hour and 30 minutes. You can deploy the Quick Start in all AWS Regions except for US West (N. California). Note The Quick Start supports three deployment options based on the number of agents and tenant instances that need to be supported. If you are deploying the Quick Start in the EU (Paris) Region, choose Option-1b, Option-2b, or Option-3 for the Instance Type parameter. For all other regions, choose Option-1a, Option-2a, or Option-3. For more information about these options, see Appendix B, AEC Capacity and Sizing, in the AEC Installation Guide on the Acqueon website. Follow the instructions in the AEC Integration Guide to complete post-deployment configuration tasks.